Astral Tower and Residences at The Star welcomes travelers to top-notch accommodations with picturesque views of the Sydney Harbour set in enviable location. 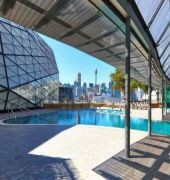 This luxurious Sydney property offers access to the casino, vibrant nightlife and leisure options at The Star entertainment complex. While in this part of Australia, tourists should not miss taking photos of Sydney Opera House and Harbour Bridge, strolling around Darling Harbour and admiring panoramic views from Sydney Tower.Astral Tower and Residences is set on lively Pyrmont Street in Sydney, close to Sydney Convention & Exhibition Centre. Vacationers watch shows at State Theatre and Capitol Theatre, have fun at Bondi Beach or find quiet time at Royal Botanic Gardens.The 480 deluxe and elegant rooms and suites feature soundproofed windows air conditioning, cable/satellite TV, safe deposit box, mini bar, coffee/tea maker, mini refrigerator and hairdryer.Diners at Astral Tower & Residences Sydney feast on modern Japanese cuisine. The ASTRAL TOWER is a Tourist hotel. Located in SYDNEY area. Shopping is accessible by bus/taxi and the nightlife/restaurants are easily accessible by taxi or bus from the hotel. 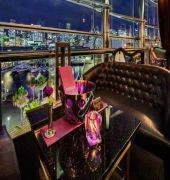 Descriptionclass="small" style="text-align: justify; font-size:11px;">Astral Tower and Residences at The Star welcomes travelers to top-notch accommodations with picturesque views of the Sydney Harbour set in enviable location. 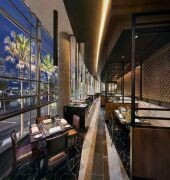 This luxurious Sydney property offers access to the casino, vibrant nightlife and leisure options at The Star entertainment complex. While in this part of Australia, tourists should not miss taking photos of Sydney Opera House and Harbour Bridge, strolling around Darling Harbour and admiring panoramic views from Sydney Tower.Astral Tower and Residences is set on lively Pyrmont Street in Sydney, close to Sydney Convention & Exhibition Centre. Vacationers watch shows at State Theatre and Capitol Theatre, have fun at Bondi Beach or find quiet time at Royal Botanic Gardens.The 480 deluxe and elegant rooms and suites feature soundproofed windows air conditioning, cable/satellite TV, safe deposit box, mini bar, coffee/tea maker, mini refrigerator and hairdryer.Diners at Astral Tower & Residences Sydney feast on modern Japanese cuisine. - My partner and I stayed at the Astral Residences for our anniversary in March and were upgraded from a deluxe harbourview room to a 1 bedroom apartment. The rooms were beautifully presented and very spacious. - The room offered a fully functional kitchen with crockery, appliances and wine fridge/freezer. 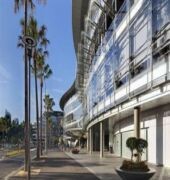 - Connected to the casino and a small stroll to shops, cafes, restaurants and bars. - When booking the room we were unaware of any construction taking place so it was extremely hard to find the entrance to the hotel. Unfortunately the construction was very loud and vibrated the room despite being on such a high floor. - Rooms were left uncleaned for a large proportion of the day and we had to call up in the late afternoon for it to be completed. After leaving the hotel again for about an hour or 2 - it was only just started to be cleaned. We received an upgrade on our room to the Penthouse. The experience was fantastic with amazing views over darling harbor and stunning views of the city at night. The location is great with the light rail underneath, the ferry terminal across the road. If you are seeing a show at the Lyric Theatre - there is no need to go outside. The complex is large but no matter which part you are in the service is exceptional and the staff very friendly and helpful. There is a taxi stand inside so all forms of transport are covered. This is the second stay I have had here and would certainly recommend it. Thank you for your excellent five out of five review following your stay! We always enjoy welcoming our guests back and appreciate you choosing to stay with us. Your kind comments on our transport facilities and convenient location are appreciated. The Penthouse is definitely a stand out experience and we're thrilled that you enjoyed the upgrade! Thank you also for acknowledging our very friendly and helpful staff through out the complex and the exceptional service they delight in offering our guests. We look forward to welcoming you back to Astral Tower and Residences for another stay. 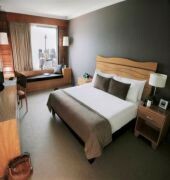 Refurbished rooms are great and bed was comfortable. Bathroom lighting is not the best but is spacious. Views over the harbour are okay. Room was clean and the casino smell did not linger in the rooms. We're thrilled that you had a comfortable stay. We do hope that we can have another chance to welcome you back in the future. Overall a great hotel with friendly and happy staff but staying on the weekend the whole area is just soo busy with hundreds of people around the food court, hotel lobby and casino entrances. After a confusing arrival friday due to the construction going on we found the valet parking and Michael and Philip looked after us and our car, they took our luggage whilst chatting and laughing away with my partner, both were friendly and we coincidently ran into them when leaving on Sunday with both of them remembering us and were genuinely interested in how our weekend was, my partner actually commented how nice it was to be greeted by staff who enjoy their job, have the skills and language to actually communicate with you and aren't robots!!! As mentioned in other reviews the rooms are amazing and we will return but for a quiet romantic weekend it's not really the venue, there's just too much going on in and around the casino. Thank you for taking the time to let us know about your recent stay with us. We're delighted that you enjoyed our amazing rooms and the service from our happy and friendly staff. Michael and Philip will be thrilled to learn that they made a wonderful impact on your stay and will be recognized by our team for their efforts. We understand that the casino environment is not for everyone, however we are excited that we'll be able to welcome you back for another stay. We would love to hear from you when you are thinking of returning, please do not hesitate to contact us on StarAstralAssistantManagers@star.com.au.